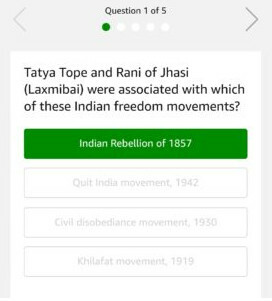 Amazon Freedom Quiz Answers Today: Win Rs 5,000 Pay Balance! Independence day is coming and Amazon India has prepared themselves for the Amazon Freedom Sale which is starting from 9th August to 12th August 2018. But that’s not the end of Independence day celebration. 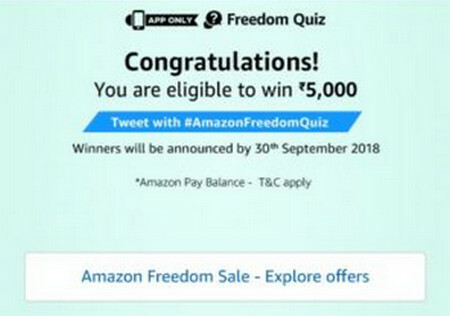 Amazon India has also arranged the Amazon Freedom Quiz Contest where participants can win flat Rs 5,000 as Pay Balance into their account. 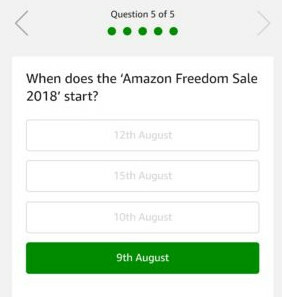 So, let’s see all the Amazon Freedom quiz answers today. Here are all of the Amazon Freedom quiz answers today. Just install the Amazon mobile app on your smartphone and participate in the contest by clicking on the Amazon Freedom Quiz Contest banner from homepage. You will be asked the quiz questions. Just see the answers from below and complete the participation. Q. Tatya Tope and Rani of Jhasi (Laxmibai) were associated with which of these Indian freedom movements? Q. As of 2018, which Indian most recently won the Nobel prize? Q. 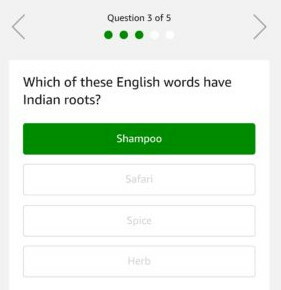 Which of these English words have Indian roots? Q. 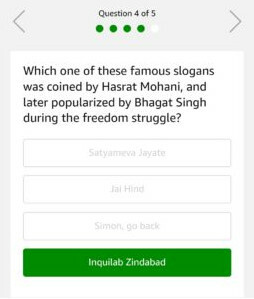 Which one of these famous slogans was coined by Hasrat Mohani, and later popularized by Bhagat Singh during the freedom struggle? Q. When does the ‘Amazon Freedom Sale 2018’ start? After giving all the Amazon Freedom quiz answers, the contest will be completed and the winners will be chosen via lucky draw. Because, lots of participants will be there who also gave correct answers to the quiz questions. So, lucky draw is the only way to select the winners. Contest is available for participation from 3rd to 12th August 2018. Each winner will get Rs 5,000 in their Amazon Pay Balance. This balance can be used to shop various products from Amazon India store.